The best way to roast up your sweet potatoes for maximum crisp from The Whole Smiths. Say good-bye to soggy sweet potatoes with this easy to master technique. 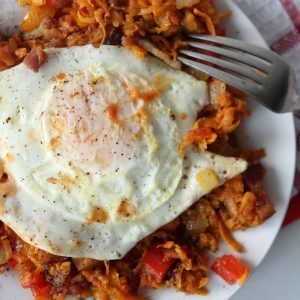 Perfect for your Whole30. Wise men (aka the 69 Boyz) once said it best… When I dip you dip, we dip. Now dip baby, dip! I don’t care HOW old you are, everyone likes dipping their stuff. Everyone. Maybe we aren’t dipping our broccoli into ketchup anymore but we still love the action of dipping SOMETHING into SOMETHING, right? 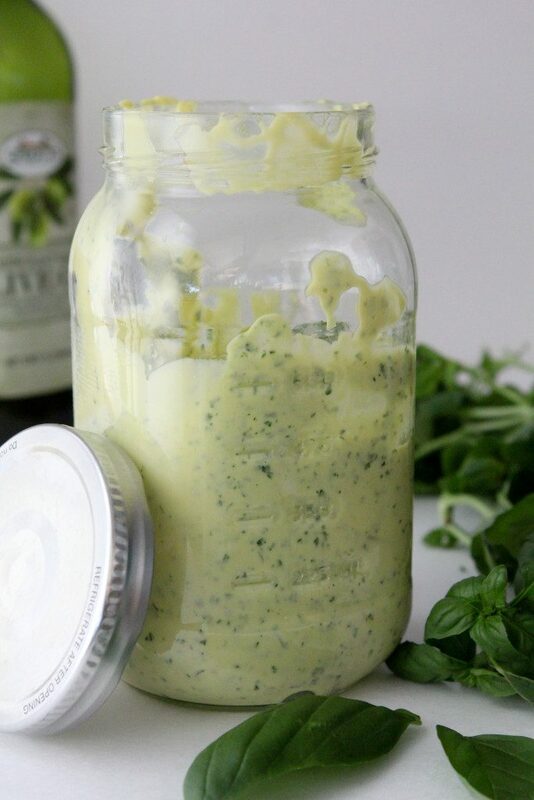 This week I made a pesto version of my mayo and it was delicious, you must check it out. There are so many uses for it, it’s become a staple around these parts. And when I find something I love, I try to find every.possible.thing to combine it with. So this week I roasted up some sweet potato “chips” and decided I needed to combine them with the fresh basil mayo I had just made. Well, I can tell you this… I can’t believe what a perfect flavor combo these make! Not only are they the perfect flavor combo, I realized the trick to getting your “chips” perfectly crispy. Now, let me just say, they aren’t going to turn out like traditional crispy fried chips because they aren’t But they WILL turn out to be perfectly roast, crispy-in-all-the-right-places, sweet potato “chips”. So here’s the secret. You want to line two (or more, depending on how many you make) baking sheets with parchment paper. 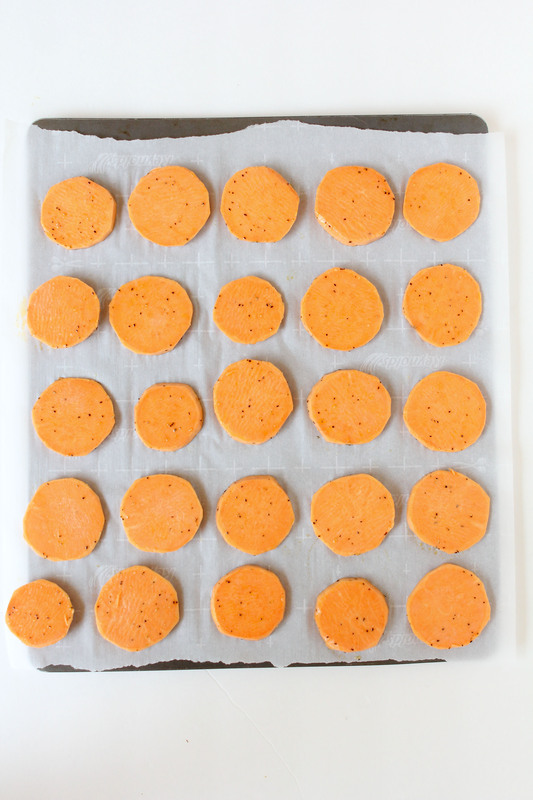 From there you’ll add the sweet potato discs into a single layer, evenly spaced apart. Make sure to give them enough wiggle room between discs as this will help prevent them from getting soggy. Think of it like this, when you’re cooking the sweet potatoes they’re going to let off a bit of steam. If those little guys are all crammed up in there steaming each other, they’re going to come out soggy. Makes sense, yes? I also recommend coating them with just the right amount of oil, preferably avocado oil but olive or coconut will work as well. Make sure not to drown them in oil otherwise they WILL end up a soggy mess as well. These were a huge hit with the kids, Teagan would have probably eaten a whole pan had I let her. That kid… But I can’t say I blame her. 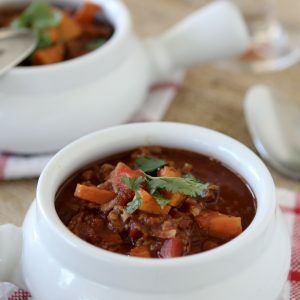 It’s little recipes like this that make my life being mom around here so much easier. Although my kids are great eaters it can still be a fight getting them to eat their dinner some days but not when I serve these. If you’re into bribes these are a good thing too as I always say you don’t get your sweet potatoes until you’re done with ________. And now you know! Getting the perfect ‘do on your sweet potatoes is easy if you know the proper technique. 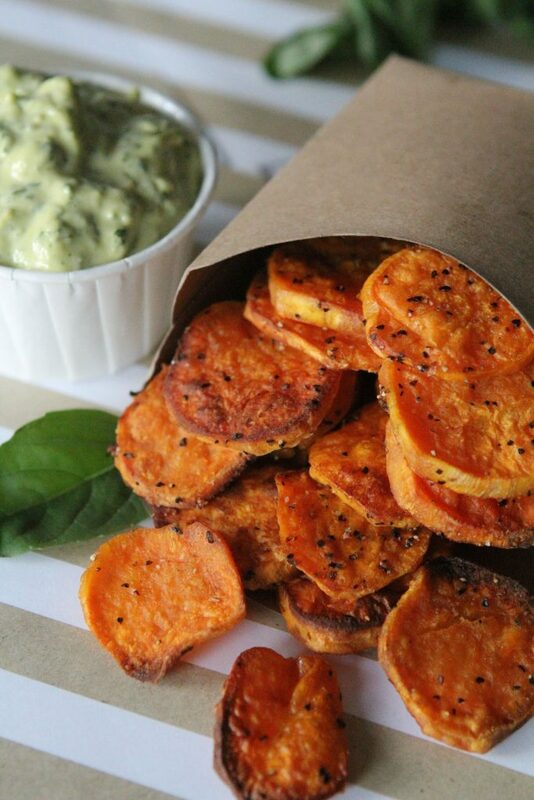 Just say no to soggy sweet potatoes because a soggy sweet potato is a sad sweet potato. If you’re looking for another fun way to enjoy your sweet potatoes, you should also try your hand at some Sweet Potato Toast from Little Bits of Real Food. I’m sure you’ve heard it’s all the internet rage these days and the hype is real, so check it out. Peel and slice sweet potatoes into 1/4 inch discs. Add the sweet potatoes, oil salt and pepper to a large bowl and toss to coat evenly. Arrange the sweet potatoes into a single layer onto the parchment paper lined baking sheets and place into the oven. After 20 minutes flip the sweet potatoes to ensure even roasting. Roast for remaining 15-20 minutes until sweet potatoes are golden brown. Can these be frozen and reheated at a later date? Hmm, Ive never tried that but I don’t think they’d retain any crispiness to it. They never seem to get very crispy like regular potatoes. Most of the time they won’t be just like regular potatoes because they have a different composition.. But if you cut them thin enough and line a baking sheet with parchment paper you should get a good crisp to them! 1/2″ is really thick, is that correct? In your article you say use a baking sheet and parchment paper, but in the actual recipe you say to use a lightly greased glass pan….. I’m confused! The verbiage mentions parchment paper and the recipe instructions says to grease the pans with coconut oil. Which one works best? Or should I grease the paper? I don’t understand- in your recipe you say to coat glass dishes with coconut oil but above you say the secret is to use parchment paper on cookie sheets– not sure which to do?? So excited to try this! New to the gluten free world, not by choice due to allergy. Thank you. Made these tonight and they were so yummy & much crispier than any other recipe I’ve made!